Optimized for peak performance, the Android-powered Samsung Galaxy S III offers probably the most sophisticated interactive mobile experiences to date. You are able to send photos, videos, and information easier and faster than ever at the same time as staying in close connection to friends and members of the family from wherever you are. Intuitive, stylish, and simple to use (see larger image). Delivering impressive processing power to allow more applications to be accessible concurrently, the Galaxy S III also features a brilliant 4.8-inch display that extends to an ultra-thin bezel to maximize the viewing area. The expansive display is also protected by Gorilla Glass 2.0 to guard against cracks and scratches and provide enhanced touchscreen responsiveness. The Galaxy S III runs the Android 4.1 operating system (a.k.a., Jelly Bean), bringing a redesigned user interface with enhanced multitasking, notifications, full Web browsing experience, and more. You can also enjoy innovative, next-gen features such as Face Unlock, which uses facial recognition to unlock the Galaxy S III, and Near Field Communications (NFC) capabilities. Going beyond simple point-and-shoot photography, the 8-megapixel rear camera offers a Burst Shot mode that captures still pictures at a rapid-fire pace at three images per second with zero shutter lag, and its Best Shot feature recommends the best picture to keep based on colors, lighting, and clarity. It also records Full HD 1080p video with a backside illuminated sensor that improves performance in low light environments–and you’ll even capture a photo at the same time as shooting video. Other features include Wireless-N Wi-Fi connectivity with mobile hotspot capabilities (enabling you to connect up to 10 devices to your Sprint 3G/4G mobile broadband), Bluetooth 4.0 with stereo audio streaming, 16 GB internal storage, memory expansion via optional microSD cards, and up to 9.2 hours of talk time. The Galaxy S III has enhanced features that both you and your contacts will enjoy. It’s designed to make sharing easy and more direct so your friends and family can experience every moment with you, regardless of your location. Connect Through Touch: With S Beam, just place two Galaxy S III phones back-to-back and you’ll transfer photos, videos, documents, and more. In just three minutes you’ll successfully share a 1 GB video file–it’s fast, easy, and you don’t even need a Wi-Fi or cellular signal. Send Pictures in a Flash: Thanks to Buddy Photo Share, the Galaxy S III recognizes the faces of your friends, so it can share photos with them right away. And with Share Shot, you’ll send photos to all your party guests so everyone leaves with snapshots of the event. Access Content on Multiple Devices: Through AllShare Play, you can share files with other devices and access those files on more than a few devices, such as documents or multimedia files between your Galaxy S III phone and a tablet, PC, or television. With AllShare Group Cast on the Galaxy S III and a Wi-Fi network, you’ll share and collaborate on documents, presentations or images in real-time with multiple friends or co-workers without loading the file separately. Smart enough to detect your face, voice and motions, the Galaxy S III provides a more convenient and natural way for you to interact so it fits seamlessly into your daily routine. Tell Your Phone What to Do: The S Voice feature enables the Galaxy S III to in fact listen and respond to your words: tell it to wake up, snooze, take a photo, answer a call, send a text message, or play a favorite song. Don’t Miss a Message: If you’ve been away from your phone, the Smart Alert feature will give you a vibrating nudge to let you know about missed calls and messages. 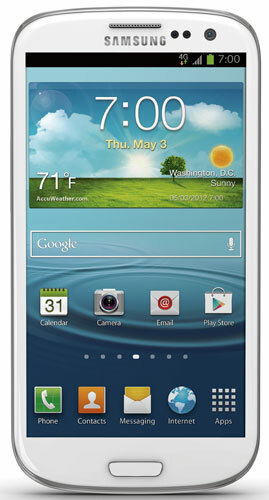 The Samsung Galaxy S III weighs 4.7 ounces and measures 5.4 x 2.8 x 0.3 inches. Its 2100 mAh lithium-ion battery is rated at up to 9.2 hours of talk time. Wireless-N Wi-Fi networking (802.11b/g) for accessing home and corporate networks as well as hotspots at the same time as on the go. Built-in mobile hotspot functionality allows up to 10 Wi-Fi enabled devices to share the 3G or 4G experience on the go with a laptop, camera, music player, game unit, video player, or any other Wi-Fi enabled device. Next-generation Bluetooth 4.0 backward compatible with older Bluetooth-enabled peripherals and includes stereo audio streaming. Near Field Communication (NFC) for sharing contacts, web pages, directions, and more to compatible phones as well as payments via Google Wallet. Integrated Google Maps with turn-by-turn navigation, street and satellite views. Personal and corporate e-mail access with fortify for Exchange ActiveSync as well as mobile e-mail accounts (Google push, Yahoo!, POP3, IMAP). Dual-core 1.5 GHz processor capable of opening web pages twice as fast as most other smartphones. microSD card slot with fortify for optional cards up to 64 GB. 2 GB RAM for improved multitasking. 8-megapixel camera with continuous auto focus, zero shutter lag, face detection, high dynamic range mode, burst mode, and more. Front-facing 1.9-megapixel camera for HD video chats and self portraits.